I had the chance not long ago to talk with some friends about the fact that puzzlingly enough, times of political election seem to be times of forgetfulness. Somehow we seem to forget our usual caution of words. It is interesting that despite all of our awareness, our apparent cleverness and sophistication, we find ourselves again and again in the same silly circle of slogans, billboards and campaigns. This is high season for the act of speech. Despite the fact that in our day-to-day jargon the word “slogan” is often used to belittle some argument as an “empty shell”or as a general metaphor for voidness, most of us are drawn to the many election-related events, where we usually find exactly that. As it happens, it seems that we want to hear politicians speak: we go out especially to listen to them in rallies, spending our time watching them on TV, where they are very prevalent. And the interesting part is that we do this with utter seriousness, and many of us with some actual hope that guides us through, even if we are let down time and again. Usually, we are more cautious–We tell ourselves that words are not the important thing; “it is what one does or does not do that matters in the end”. But in fact, at times of election, we not only witness our significant reliance on those good old dingy words, but we also realize our utter dependence on them. It is like someone who chronically looks for more loans just to get away from previous debts. In these loudly outspoken words of others, we are looking for salvation, each time anew, each time we are hoping to be finally saved. Man is a rope stretched between the animal and the Overman — a rope over an abyss. […] What is great in man is that he is a bridge and not a goal: what is lovable in man is that he is an over-going and a down-going. I love those that know not how to live except as down-goers, for they are the over-goers. The grammar of elections always has a goal, a purpose. The “down-goers”, on the other hand, have no goal except for continuation and evolution ( or as Nietzsche puts it: “I love those that know not how to live except as down-goers, for they are the over-goers”). The hope we project on words, and that stands behind the entire aesthetic manufacturing of instant-politics during elections, is based on the aspiration to lift the weight that hangs on all of our shoulders, the weight of responsibility and of serious decision-making. For the most difficult thing is not to accept what is so handsomely offered to us, but instead to insist on our free-“down-going” possibilities. Whatever people might promise us while standing on glittering shiny stages, victory is not around the corner, thank Heaven. It is at such a time exactly–i.e. election time-that one should give up the search within this circus of words and well-spoken promises.When everyone around us seems to speak so nicely about everything, we must resist the well-articulated phrase. Indeed, it seems that this is exactly the right and best time to do so. See a short piece of mine in the magazine +972, concerning recent events which took place in Jerusalem, Israel. 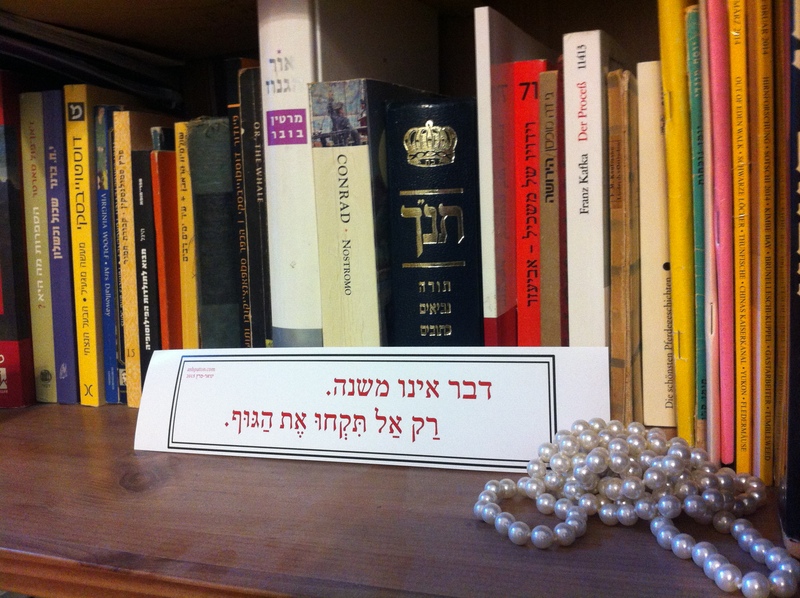 The piece was originally published in Hebrew (in a shorter version and in a longer version). 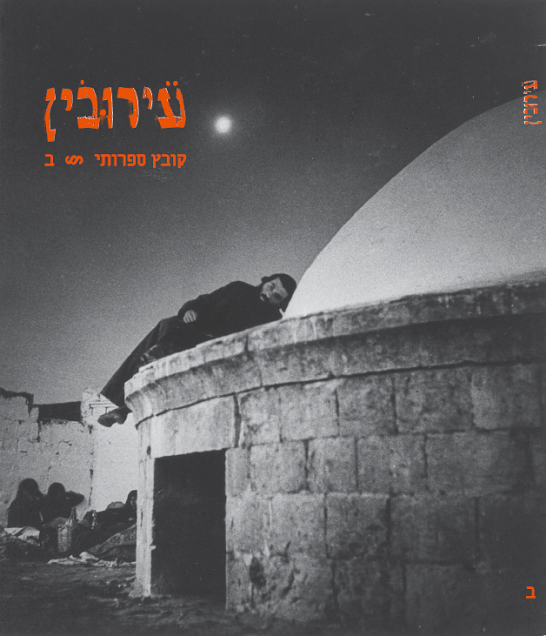 The following poems are the translations of three Hebrew poems, written in Jerusalem in the year 2014. 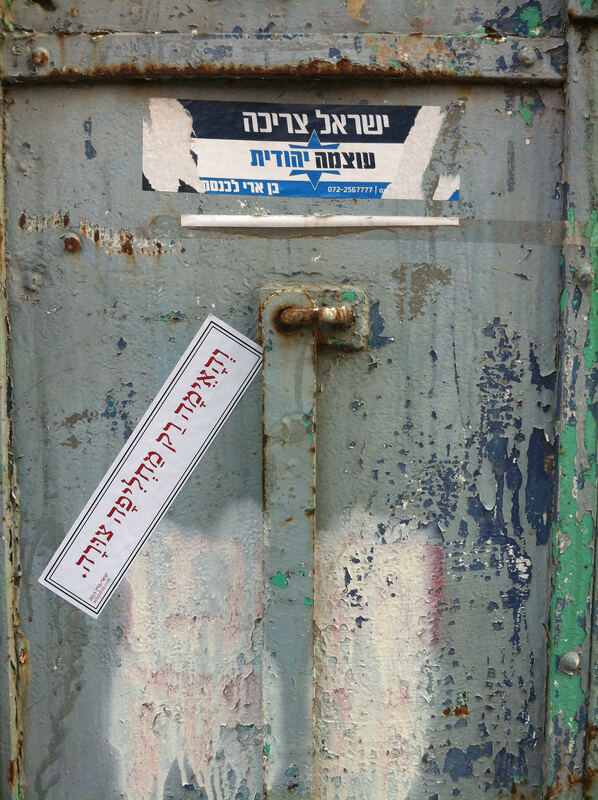 Two of them were published in Hebrew journals (Eyruvin and Iton 77), and one was published only as a sticker (as part of a broader sticker-project which includes other poems as well), which was and still is distributed all over Israel. In my garden, five daffodils grew tall. I told you daddy. That’s just how it is now. Tomorrow will rain. Clouds, heavy winds. But the crows are waiting for Grandpa’s rest to begin. And the horror only changes its delights. That’s just how it is now. We cannot live with our convictions. No. We cannot live with our convictions. This is just how it is now. The horror only changes its delights. Everything’s falling. The sky and the mountain are too. The temples of the gods aren’t enough for all dwellers of the land. Our days–Who imagines our days? And our temple, who knows. We asked for heaven, mercy. And here we are–only dirt. These are the things I kept hearing from people during the elections in Israel. I didn’t know exactly what they meant. They didn’t either I suppose. But after six years with Netanyahu in office, and another three years during the nineties, i.e. nine years all in all as Prime Minister of Israel – many seemed to understand that Benjamin Netanyahu needs to take a break. We need some time to catch our breath. Well, many indeed- but obviously not enough. It is difficult to avoid thinking of death these days. I sit in Jerusalem, hearing about the armies of the Islamic State (IS), seeing films, listening to what they have to say for themselves. I am thinking of death, and of time. And more than I am used to, I am thinking of geography. How far are they from where I am now? How far are their beliefs? I know it is close, and I find myself thinking of death. Not my own death, as one tends not to, but of death in general. About what it must mean to these people I just saw in pictures, waiting for “their heads to be cut off with knives”, as the murderous “soldiers of the caliphates” have just promised them, in a language I don’t speak. In the pictures I see only men. They wear weapons, and they say that they despise “America”, as they are using America’s ethos of justice to justify their deeds. They talk of the “oppressed” and of good ways of conduct. They want to be “true”, “faithful”. They fight tyranny, they say. They are not ashamed of themselves. They do not think of death. I hear their promises of “beautiful virgins” waiting for them, these men with weapons, who do not drink Alcohol and are prepared to die for this Abu Bakr Al-Baghdadi, their Caliph, their ultimate death. And in all the pictures I see there are no women. In a film I just watched about what’s going on, the only woman I see is a glimpse, a fragment of a second. It is when the men of the “Islamic State” wander around with their vehicle in the streets of a town in Syria, and they stop by a man, standing with his wife. As much as I can tell the woman is covered with black cloth. I can hardly see anything, because the camera doesn’t focus on her figure. One of the IS men, asks the man to approach to the car. He blesses him, as Muslims are accustomed to do, and asks the man to tell his wife to change the veil’s color. He doesn’t give any reason for this “request”, but nonetheless the man agrees immediately. No argument. Perhaps it is the gun the IS man is displaying near his shoulder, the top of which peeps from beneath the frame. Then the car and the camera inside it, to which we are attached of course, carry on. The IS man now explains to the camera-man that there is no reason for a woman to be “displayed” – “she is not a product”, he says. I suppose he thinks himself very clever in saying something like that. Perhaps he thinks that this is the language to use when talking to a camera-crew, making a film intended to be distributed around the western world. This “woman is no product” slogan sounds very close to common feminist views, trying to fight the way women function in society, and to change the ways women are (still) regarded as “products”, as “aesthetic objects”, and to strengthen and advance ideas of true human-equality of men and women . But of course the difference is that these feminist views are intended for the benefit of women, that is- the benefit of human beings, while this IS man’s “protection” of the woman’s body is intended for the sake of God. In God’s land, in the land of the Sharia incarnated in the IS, there is no “woman”. In fact there is no “man” either. There are only Shahids and Jihadists, martyrs and saints. Indeed, there is no death. Only “glorified death” –which only means something when put on display in front of a cheering crowd, and which doesn’t leave anything at all for the dying. Even at the very end, after all the fighting is over, there are no women, no men – only “beautiful virgins”, and sainthood. Indeed, as George Orwell once wrote: “No doubt alcohol, tobacco, and so forth, are things that a saint must avoid, but sainthood is also a thing that human beings must avoid.” (Reflections on Ghandi). Sainthood is something human beings must avoid if they want to remain human beings. But the Islamic State doesn’t leave any place for humans in it. It is indeed the state of Islam. Not of the Muslim people, not of Muslim women and men. In this emerging “state of God”, there is only room for saints. And that is why there is no place for death – true, gruesome death; because saints don’t die, they are always martyred. And when there’s no death, when there are no human beings to die, there is no horror, no sadness, no compassion.